This is my homemade 1959 Panhead. I'm just a poor welder that wanted a Harley, so I built myself one. I like to sit on it at night and drink beer and just do some far out thinking. 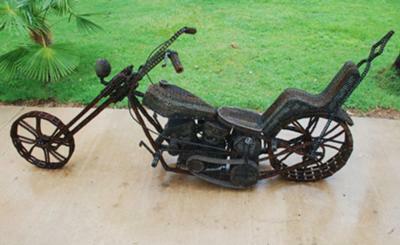 I weld, I build Harley's and I do art and "Sir" I will say this- that's a fine piece of work. All three of my favorite things in one beautiful chunk of metal. Doing work like that you won't be a poor old welder forever. Brother!!! I love your BIKER heart!!! You are the essence of what the biker USED to be.....REAL!!! Walking into a (dealership)with a credit card,buy a bike and a "Biker costume",put 100 miles a year on it and spend the rest of the time telling your accounting buddies "Road Tales" does NOT make you a BIKER!!!!! It's nice to see someone preserve the true meaning of being a biker as you have with this picture. I truly hope your Panhead dream comes true........Thanks bro. Awesome work John, thats some of the best metal art I've ever seen!